This outstanding soccer trophy is part of our 3D Motion Xtreme Resin Series, with 3D designs featuring athletes mid-play. This Soccer trophy is made of a silver resin with gold detailing, and features a soccer player ready to kick the ball, with a large soccer ball in the background. This 5-inch trophy will stand out in any trophy cabinet, and help your players celebrate team success and passion for soccer. 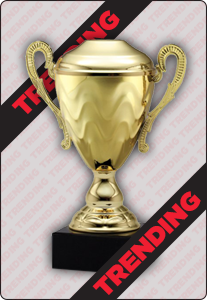 Engrave this trophy with a special message or event details.